Superman Fan Podcast Episode #271 Part V: 2013 Superman Celebration Interviews! Top row L to R: Jim Hambrick, Bruce Scivally and Brett Breeding. 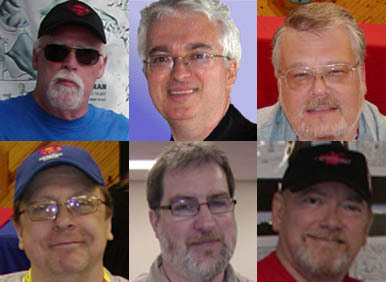 Bottom row, L to R: Ron Frenz, Chris Sprouse and John Read. Download Episode #271 Part V! This episode is comprised of the interviews I conducted at the 2013 Superman Celebration between Friday, June 7 – Sunday June 9, 2013. The time stamp for the beginning of each interview is in parentheses. – Jim Hambrick (5:37) is the owner of the Superman Museum and store and the Americana Hollywood Museum. – Bruce Scivally (15:45) is the author of BILLION DOLLAR BATMAN and SUPERMAN ON FILM, TELEVISION, RADIO & BROADWAY. – Brett Breeding (24:16) Superman inker during the 1990’s. – Ron Frenz (35:43) artist for Superman in the mid to late 1990’s and Spider-Girl artist in the 2000’s. – Chris Sprouse (52:22) artist of the backup stories in the New 52 ACTION COMICS Grant Morrison issues. – John Read (1:10:04), curator of the ONE FINE SUNDAY IN THE FUNNY PAGES exhibit of over 100 comic strips, all published on the same day. His exhibit will be on display all month at the Bay County Library in Panama City, Florida during the month of August 2013. He will also be a guest at CreativeCon on Saturday, August 24, 2013, also at Panama City’s Bay County Llibrary. Next Episode: 2013 SUPERMAN CELEBRATION WRAP UP! The Following Episode: MAN OF STEEL MOVIE REVIEW! Superman Fan Podcast Episode #271 Part III: 2013 Superman Celebration Artist Q & A Panel! Download Episode #271 Part III! The Artist Q & A Panel featuring the main artists of Artist Alley occurred at 3:00 p. m. on Friday, June 7, 2013. Featured on the panel were Jim Hall, Art Baltazar, Chris Sprouse, Brett Breeding and Ron Frenz. The panelists answered questions from the audience and touched on topics such as the evolution of the comic book industry, their experiences working on the Superman titles and their artistic influences. Next Episode: 2013 SUPERMAN CELEBRATION PART IV: 75 YEARS OF SUPERMAN PANEL! The focus of this panel will be the evolution of Superman’s uniform over the decades.